Cupping therapy is a traditional, time-honored treatment that is safe, comfortable, and remarkably effective for many health disorders and chronic pain conditions. It’s the use of negative pressure (suction) rather than compression (as with massage) to accomplish bodywork ranging from myofascial release to lymphatic drainage, and everything in between! Cupping therapy rapidly facilitates rigid soft tissue release, loosens and lifts connective tissues, breaks up and drains stagnation while increasing blood and lymph flow to skin, muscles, tendons and ligaments in ways not possible using compression. Cupping helps direct the body’s natural healing mechanisms to engage, and clients usually experience healing from injuries in a much reduced period of time – either for acute, new injuries, or old stubborn ones with long-term chronic pain. Cupping therapy is great for shoulder pain, low back, hip, or sciatica pain, or really any joint or fascial pain that you may be dealing with (knee, wrist, plantar fasciitis, and more). Even numbness from nerve restrictions can be alleviated from cupping therapy. Do you have digestive or menstrual discomfort? Abdominal cupping can provide relief! Cupping & Bodywork sessions are more intense as they are cupping-focused with our certified cupping therapists. Massage & cupping appointments are available with any of our licensed massage therapists to get targeted deep tissue work during your massage. Cups may be used in one place for a time, or they might be moved over the tissue for a negative pressure massage known as massage cupping. There are several types of cups that may be used by your therapist: glass cups (the traditional kind used by mostacupuncturists); Kangzhu cups, which are plastic with a suction tool; baguanfa cups, which are silicone and can be popped on and off or moved around by hand; biomagnetic cups which utilize the positive and negative charges to facilitate healing, and facial cups, which are designed specifically for the face and will not leave any discoloration for the facial rejuvenation service. After any cupping treatment, it is important to avoid excess cold or heat. During winter, bundle up and cover your neck well. Avoid hot baths or saunas for a minimum of 4 to 6 hours, and 24 hours if possible. Let your body rest and avoid exertion after cupping therapy. Anti-cellulite cupping is indeed effective! Cupping is always effective at removing toxins and increasing circulation in your fascia, blood, and lymph, and cellulite responds to cupping therapy as the rest of your fascia does. Our Certified Cupping Therapists have been trained in anti-cellulite treatments, and we have personally seen the results after treating a client’s leg after an injury… over time that leg had no cellulite at all, while the other leg did. For best results, cupping should be done at least weekly and combined with an anti-inflammatory diet and overall healthy lifestyle. Over time, your skin will appear more toned and taught, and the cellulite dimples and puffiness will go away. See our article for more information. 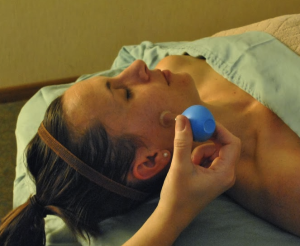 Facial cupping may also be done more therapeutically for TMJD and as well as Bell’s palsy conditions, which may produce discoloration that sometimes occurs with cupping therapy. There are contra-indications to cupping therapy, so be sure to discuss your health history with your Certified Cupping Therapist before your appointment. Toxins and stagnation will be cleared from deep within your tissue during your session, which may result in discoloration on your skin from the cellular debris and pathogenic factors that have been cleared. This discoloration is not a bruise (no capillaries are broken during cupping therapy), though it may be similar in color. Discoloration varies widely, depending on the level of restrictions in your tissue, the length of time tissue has been restricted, and what other toxins are present in your system. Discoloration lasts from a few days to a few weeks. It is important to avoid strenuous exercise for at least 24 hours after cupping sessions. Cupping sessions should not be combined with any aggressive exfoliation (wait at least four hours after shaving). Avoid cupping sessions if you have a sunburn or are hungry/thirsty immediately before your session. It is helpful to consume and abundance of clean water after your session.